To realise an architect’s vision of a roof and ensure that it lasts as long as possible, the design and specification of the roof structure is crucial. WALLS & ROOFS takes a closer look. Although not always as visible, a roof’s structure is just as important as the roof covering in ensuring that the building is properly enclosed and protected from the weather elements. And when architects come up with the odd one-of-a-kind roof, designing the structure can become quite complex. Edward Curry, co-owner of Giant Engineering, points out that there are certain criteria that need to be considered and sometimes these aspects play a big part in what the final product will look like. “Wind plays a huge role, along with the height and classification of a building. In addition, one needs to make sure that the roof has effective water flow to prevent leaks,” he explains. “Specifications on roofs have changed dramatically over the last 20 years, but we still see materials being specified that are no longer compliant to the new SANS standards. It is imperative that architects consult with roof designers to assist them in their specifications and design,” he advises. Aesthetically speaking, when it comes to exposed trusses, Curry suggests timber to be the more appealing material, as it is beautiful to look at. However, he mentions that steel and timber can also be combined in one design, for example, timber trusses with steel battens and runners. “Options are endless,” he says. Roofing engineer and managing director of Hi-Tech Nail Plate, Dave Anderson, points out that both timber and steel trusses have a specific place in the market. “Each roof is unique and therefore each project should be assessed on its merits to find the right solution,” he states. While both timber and steel can be used for a wide range of applications, one is sometimes more suited than the other. “Timber is generally the most economical solution for smaller clear spans of up to 15m and conventional hot-rolled structural steel the preferred solution for extremely large clear-span applications, while lightweight steel fills the gap in-between,” Anderson says. “The roof covering and pitch of the roof specified also play a large role in the determination of the ideal truss solution. Roofs with concrete tiles are more suited to timber construction, while roof sheeting is equally suited to both timber and steel. Curry adds that steel is a non-combustible material, making it the better option for public buildings due to the low fire risk. Whereas timber trusses can allow fire to spread through the roof of a building, with steel trusses there is a better chance that the fire would be contained in the room where it started. He notes, however, that the more complex a roof, the more expensive steel becomes, for example, complex hipped roofs which are generally more expensive than simpler gable-to-gable roofs. “Often architects are so set on the look and design of their structures that they forget to take into account the support that is required to accomplish a specific design and don’t always take into consideration the costs involved,” Curry states. “On a hipped roof, internal bearing walls can assist in cutting costs, because by using such walls for support, multiply girders are eliminated. Strategically placed supports can help to keep costs of roof structures to a minimum. It doesn’t always fit into an architect’s vision, but sometimes a simple thing like changing a single wall to a double wall can have a significant impact on the cost of the roof,” he explains. Uwe Schlüter from MiTek Industries points out that, as mentioned by Edward Curry of Giant Engineering, timber roofs can most certainly be mixed with light gauge steel (LGS) top-hat battens or purlins, but says that the actual advantages of doing this are not always fully understood. • The product cost saving due to larger truss spacing can amount to approximately 10%. • The volume saving, affecting transport and storage, can be approximately 90%. • The mass (kg) saving, affecting transport and handling, can be approximately 60%. “In addition to these savings, LGS offers other inherent advantages such as perfectly straight beams, ease of installation, greater safety due to the absence of defects, as well as being fully recyclable,” Schlüter adds. When specifying the roof structure, Anderson advises that the single most important criterion is the actual clear span of the roof structure and hence the long-term durability of the structure. “Second to this would be the cost of the structure, but there are also many others factors such as architectural aesthetics, fire risk, accessibility for construction, transport and delivery logistics, and more, that need to be taken into account,” he states. Richard Bailey, who heads up Maxspan Roofing and Roof Inspection Services, says the ideal starting point is for architects or specifiers to supply drawings of what they require.  The extent of the roof.  The nature of the ceiling.  The length of the overhangs required.  And finally, any additional loads to be allowed for, such as air-conditioners, a fire pipe system, hospital gas networks and more. Bailey points out that architects are often somewhat unaware about the depth required for the heels of a long-span truss, and will have to adjust their plans when the designer insists on using more depth. However, the biggest confusion is usually around loads. “If the supplier designs a roof to support metal sheeting, it won’t be able to carry a heavy tile load. Similarly, if a 150kg air-conditioning unit is added afterwards, it is difficult for the designer to modify a design, while it would have been easy to accommodate had it been specified upfront,” Bailey explains. In addition, when it comes to galvanised steel trusses, which is a relatively new material on the market, architects often run into resistance from the main contractor when specifying these. “Some people do not wish to use galvanised trusses inside a roof because they are afraid of rust, especially along the coast,” notes Bailey. “This is a huge misconception, since the steel is precisely the same as the galvanised nail plates used on timber trusses in exactly the same circumstances along the coast – the same nail plates that have been successfully keeping timber trusses connected for 45 years or more! Where a steel roof is fully enclosed, including the overhang, galvanised trusses can last over 40 years, even at the coast,” he emphasises. “More education is needed for these trusses to be better accepted,” he says. 1. Consider the location (coast/inland).  To determine the thickness of the corrosion protection coating on the base metal. 3. Determine the wind zone. 4. Specify the roof height at the highest point of the building (10m/25m/more). 5. Select a sheet profile.  According to roof slope and strength/water carrying capacity. 6. Select a sheet material.  According to service life required. E.g. aluminium or aluminium-zinc coated steel with a coating of 200g/m² is used at the coast as it has an appropriate service life of 20 years. 7. Choose a sheet gauge.  To govern the purlin spacings and trafficability of the roof surface. 8. Choose a finish (metallic or colour-coated). 9. If colour-coated, pick a colour. 10. Consider the purlin/girt material.  Specify the correct fastener (either for timber or wood). 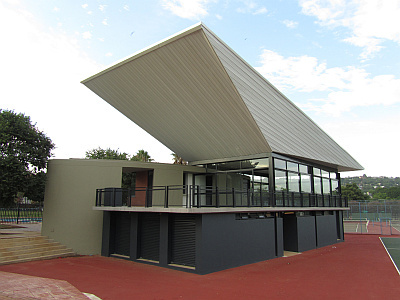 When affixing metal sheeting to the different kinds of purlin structures, Safintra’s Nicci Solomons highlights three factors that need to be considered. Firstly it is imperative to select the correct fastener to secure the roof sheeting to either timber or metal trusses. Factors such as the corrosion zone and class, the type of roofing profile (pierced or concealed fix), the fastener material and its compatibility with the roofing and insulation materials can determine the appropriate type of fasteners. Shank corrosion should also be considered, as higher corrosion areas can result in excessive corrosion of the fastener shank. Secondly, when installing a concealed fix profile onto steel purlins, a minimum slope of 2° is recommended to ensure proper drainage and prevent pooling, while on wood it is 3°. Lastly, when applying metal roof sheeting to a steel structure, the compatibility of the two materials needs to be considered as direct contact of dissimilar materials will result in galvanic corrosion. Therefore, when applying aluminium or aluminium-zinc roofing to a galvanised structure, the use of isolation tape or similar is recommended to prevent bridging of the two dissimilar materials, causing the aluminium sheeting to be compromised. At the end of the day, the completed roof should make an impression as intended by the architect, but should also last as long as possible. Full thanks and acknowledgement are given to Giant Engineering, Hi-Tech Nail Plate, Maxspan Roofing, MiTek and Safintra for the information given to write this article. Most economical for spans up to 15m. Individual members may overstress on large, clear spans. Trusses need to be prefabricated, so transport can be problematic. Any building with spans under 15m. Can be lifted onto the building in its entirety. Requires a crane for lifting. The more complex the roof, the more expensive it becomes. Public buildings such as schools, community halls, shopping centres, hospitals and more.